In this tutorial we will learn how to delete documents from a collection. The remove() method is used for removing the documents from a collection in MongoDB. 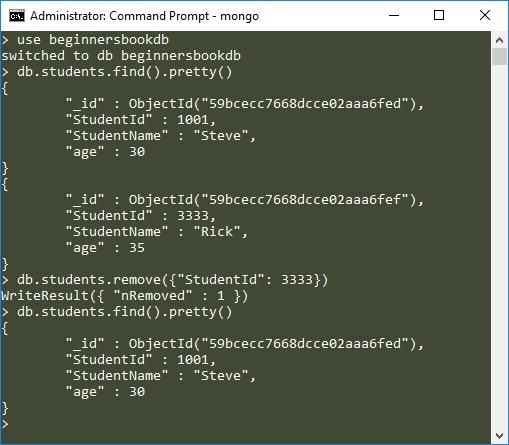 To understand how to specify criteria in MongoDB commands, refer this tutorial: MongoDB Query Document. It will list all the documents of students collection. How to remove only one document matching your criteria? When there are more than one documents present in collection that matches the criteria then all those documents will be deleted if you run the remove command. However there is a way to limit the deletion to only one document so that even if there are more documents matching the deletion criteria, only one document will be deleted. Here justOne is a Boolean parameter that takes only 1 and 0, if you give 1 then it will limit the the document deletion to only 1 document. This is an optional parameters as we have seen above that we have used the remove() method without using this parameter. For example I have the following records in collection. 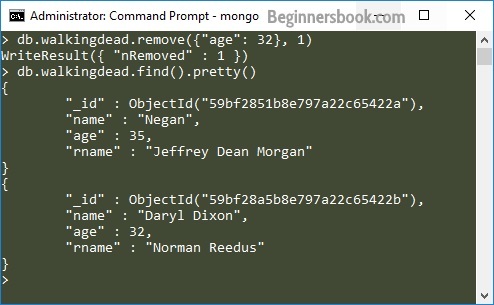 "rname" : "Jeffrey Dean Morgan"
Lets say I want to remove the document that has age equal to 32. There are two documents in this collection that are matching this criteria. However to limit the deletion to one we are setting justOne parameter to true. Output: As you can see only one document got deleted.